The rapidly expanding problem of African Swine Fever in China has led to intensive research into the development of a vaccine. According to a Reuters report on January 18th, research is directed at developing a live attenuated product. This could be developed fairly rapidly for deployment. Unless gene-deleted strains are incorporated as an antigen, the possibility of reversion exists especially if the vaccine is not thoroughly tested under field conditions. Given the urgency of the situation and with previous experience with crisis response in China, it is possible that unauthorized vaccines will emerge and unscrupulous manufacturers will peddle at best worthless products or at worst, “vaccines” capable of infection. The decision to develop a vaccine suggests that China has come to terms with the impossibility of eradication. Vaccination would be an appropriate strategy to limit spread of infection by creating a non-susceptible population. It is however recognized that China has a hog population exceeding 350 million animals, many of which are in small family-operated units frequently inaccessible to mass-vaccination programs. It will also be beneficial to differentiate between vaccinated and naturally infected herds, although this can be accomplished using PCR to detect the presence of virus. Given the high pathogenicity of ASF, there are few survivors of infection among herds so that the presence of antibodies in the absence of a history of high mortality would indicate immunity. A number of nations have also initiated programs to develop and stockpile a suitable vaccine especially since emergence of the infection in Eastern Europe about four years ago. China will have to develop a vaccine to maintain production in the presence of an endemic catastrophic infection. Concurrently the Nation will have to initiate a major restructuring of the industry leading to integration and slaughter of hogs in the regions where they are produced and consumed. 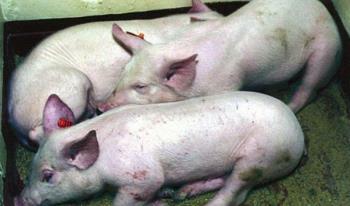 The current disconnect between areas of production requires extensive transport of live hogs and subsequent distribution of potentially infected pork. The current structure is conducive to dissemination of infection.